The nuts of the hickory trees provide calorie rich food for wildlife. Hickories are large trees that can reach 100 feet in full sun can spread as wide as they are tall. If you are fortunate enough to have one in your yard, you may see some beautiful moths and butterflies. One of the most spectacular in its larva form is the hickory horned devil which can grow to nearly five inches. The Hickories (genus Carya) supports 235 Lepedopteran species as well as providing nuts for squirrels and other wildlife. The four species are local to the DC area: Sweet Pignut (C. ovalis also called False Shagbark or Red Hickory since real Shagbark is not local to the DC area,), Pignut Hickory (C. glabra), Mockernut Hickory (C.tomentosa) and Bitternut Hickory (C. cordiformis). Bitternuts prefer moist conditions, the others are much more general and adaptable except they do not like it wet. 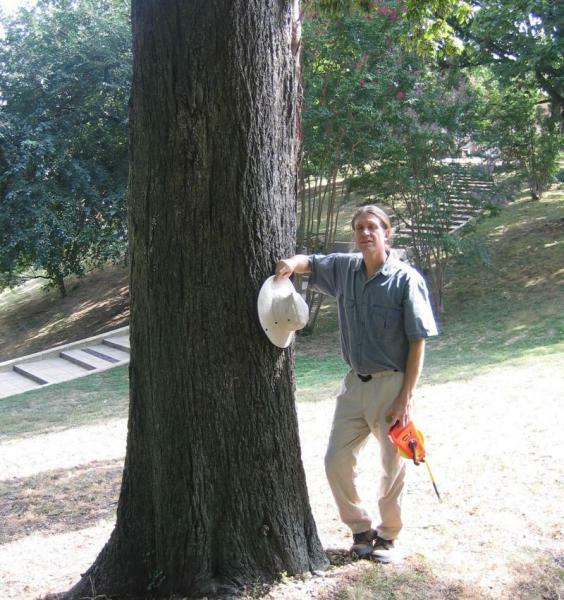 This large Mockernut Hickory appears very healthy and is growing is a protected protion of NPS property, adjacent to the Custis Mansion within Arlington Cemetery. No known human historical significance to this tree, but it may be famous to local squirrels. This entry was posted in Education, Uncategorized and tagged native plants, wildlife. Bookmark the permalink.